This train is pure class. Great job. Good news: I sent the train to FHSWman and he replied that he wants to add it to the next version. There's currently no winter map it could be used but it might be useful for the future. I almost like it more than the summer texture. Hell Yeah! On wich map can i find it? Maybe a completely new map should be created. I dont think that a conversion will help a lot if you want to setup a scenario in a map which wasn't build around this concept. Mh, would you tell me what this map should roughly look like? I carefully say that I would be interested in doing it. That's where I shot this picture but it doesn't fit in gameplay-wise and also historically. The PT-16 was first used in Summer 1944. @Xenanab: Hmm I don't think a map created around this particular train works, now if we had a BP 42 or BP 44 that would be a different story. But as a support vehicle on a map without a lot of IS-2s/ISUs and more infantry-focus it could have its purpose. I don't have a specific idea for a map in mind right now though. But thanks very much for your offer. man where can get this map love to see this train or do have to wait for the new fhsw ? You have to wait for the next release, sorry. 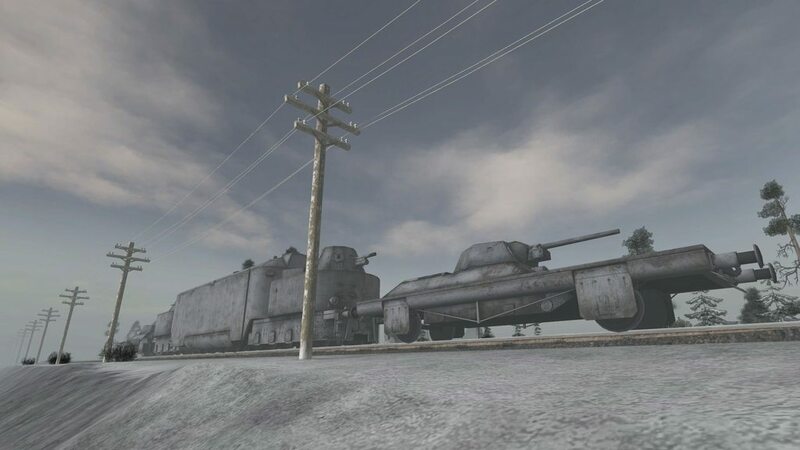 I skimmed through a Let's Play of CoD WWII just to see if there's something interesting and saw that it also has an armoured train with multiple carts. One of them seems to be the PT-16. And for some reason it's being pulled by a steam engine.